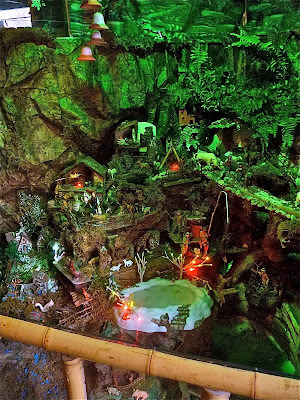 I haven't revisited the topic of the old Hamberger Christmas Display Factory since the Visagoths of Development tore down the much-older-than-imagined Cobble Hill building in the summer of 2008. Well, work on the new apartment complex has continued apace since then, never pausing for very long (unlike other South Brooklyn projects). The southern aspect is still a mass of cinder-block ugliness. 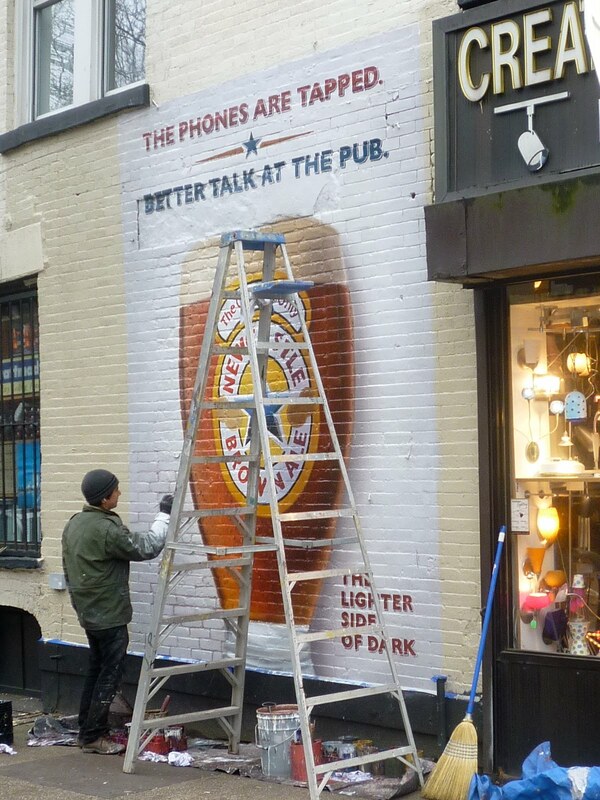 But the Warren Street side is getting some personality. And, I must say, it's not absolutely terrible. The facade kind of fits in with the street. At least the windows have a little personality. They're not just holes in the wall. However, I hope the people who move into this place realize that the address has been crossed off Santa's list. Delight on Degraw Already for Sale! Back in 2008, I spent a good deal of time happily chronicling the extensive and meticulous renovation of the an 1844 Greek Revival mansion at the corner of Henry and Degraw Streets, in Cobble Hill. 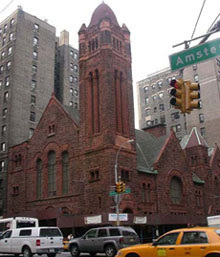 It was one of the most faithful (and, I'm sure, expensive) revamps I'd ever seen in the South Brooklyn area. 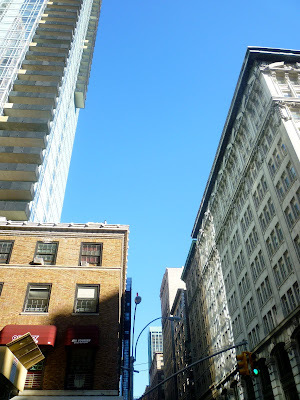 The owners truly beautified the neighborhood by reclaiming the buidling and bringing it back to its former glory. I thought the people who lavished such care on this structure would surely choose to live in it for years to come, proud of their accomplishment. But, no. Hardly months after the renovation was finally complete, the house is up for sale! There's a certain poetry in the ramshackle appearance of the Eighth Avenue and 13th Street laundromat in Park Slope. The fake folksy brickface joined to the swingingly modern red diamonds spelling out "Wash" and "Dry" on both sides. And everything's been left to thrillingly go to pot. The facade is caked in dirt and water-stained. The ribbed metal awnings have been faded by the sun. The metal gates on the windows are rusted. The plants are dead. Even the plastic seats outside are barely there, barely recognizable as chairs. And yet, business inside goes briskly on, chugging away. It's a disaster. Yet, it's wonderful-looking. The photos I posted from a 1978 tourist picture book received such a warm response that I've decided to share a few others. I've said it before, I'll say it again. 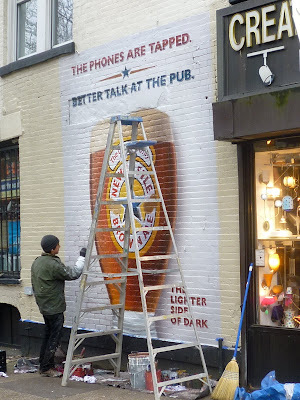 Hand-painted wall ads are the best form of advertising. 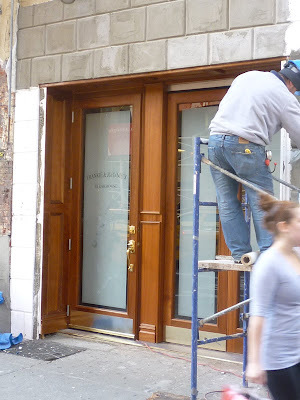 This new Newcastle spot is on Warren Street near Court in Cobble Hill. 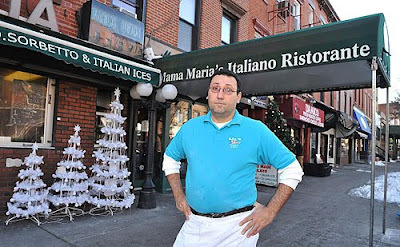 An 86-Year-Old Locksmith in Park Slope; Frankie & Johnnie's Bar Still in The Works; O'Connor's Lost Its Awning; My Parents Down Like the High Line, and Readers Don't Like My Parents; Inside a Lost Tiki Restaurant in Jackson Heights; Guss' Pickles Leaves the Lower East Side; More Revelations on Carroll Gardens Corner of Mystery. A friend recently found an old souvenir picture book of New York at a stoop sale and picked it up to give to me. It was published in 1978 and has some wonderful old shots in it. One of my favorites is the above view of Times Square, looking up Broadway from 46th Street. Notice the Howard Johnson's in the foreground. That newsstand is still there. Nothing else, though. Below are two views of Fifth and Sixth Avenues, looking fairly unchanged, aside from the people's clothes and the cars. I needed some keys made. So I stopped by a small locksmith on 9th Street in Park Slope that I've passed by a hundred times without a thought. Fifth Avenue Key Shop. Turns out the place has been in business since 1924. I never would have imagined it. But I guess key makers can be multi-generational as much as any other line of business. The owner told me the business was founded on Fifth Avenue—hence the name. But they moved around the corner after a few years and have been there every since. There are a few old pictures just inside the door. One shows that the shop used to be next door to a movie theatre. (It's a McDonald's now.) Alice's Beauty Shoppe was above. (Empty now.) A lawyer's office and Western Union Shop were on the other side. Another picture shows that the layout of the store hasn't changed much over the years. Same low tin ceiling, too. The new keys work fine. My bike screeched to a halt when I caught sight of this fantastic piece of crapitecture on Eighth Avenue in the South Slope. It's crap, no doubt about it. But rarely have I seen crapitecture that apes the curved, groovy lines of 1960s office buildings. Fifty years ago, this would have soon been full of dentists and CPAs. Today, it will be filled by condo-ites. I thought, based on a recent visit to Times Square, that the old steakhouse Frankie & Johnnie's new ground-floor bar would be open for business by now. But no. Workman are still touching up the outside. The doors are in now, though, one of them bearing the joint's name. Did the classic Park Slope dive O'Connor's lose its awning in the recent three-day blow that unleashed such wind damage on New York and its environs? Walked by recently and all that was left was the skeleton of the awning. There's just a Tullamore Dew banner protected the poor old bar now. The naked front, however, resolved a nagging question in my head. It's now clear that there was no older, cooler sign hiding beneath the newish awning. Just some cinder blocks. 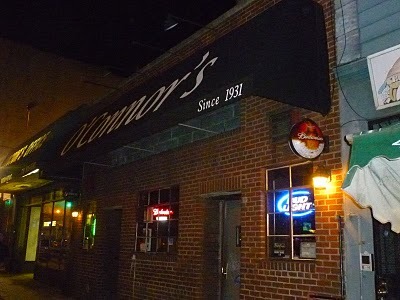 Below is how O'Connor's looked with the now absent awning. Here's the big old ugly, flashy, kinetic American Eagle building on 46th and Seventh, where the old Howard Johnson's used to be. But cast your eyes down, down, down to the sidewalk and you find this—a wonderful, grungy old newsstand from the Times Square of days gone by. Cemusa hasn't gotten this one yet. My parents were in town recently, staying in a hotel in Chelsea. 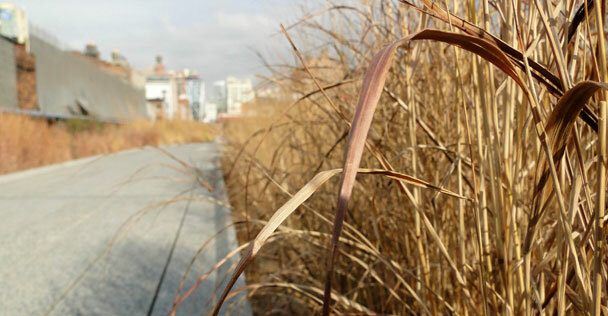 They had nothing to do one morning, so I suggested they check out Manhattan's newest, coolest, most-in-the-news park, the High Line. They did. And the verdict? "What a big nothing," said my mother, who has has kept a huge and locally celebrated flower garden in her backyard for decades. "It's full of weeds." I explained that the species that were planted were chosen on purpose for their wild and natural character. "It's not anything we'd plant back home in a park." She added that, in the winter, when such wild plants turn brown, the spectacle amounts to less than a big nothing. 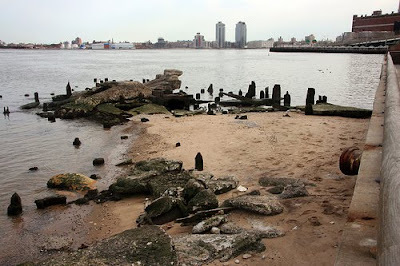 "Not much a view," observed my dad, saying the the elevated tracks only allowed you a close-up of the dirty sides of old brick buildings, underlying traffic and the West Side Highway. 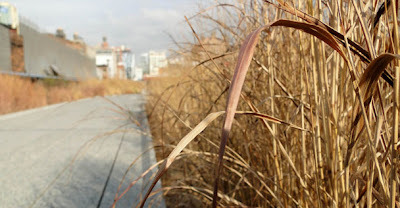 I had to admit that this was indeed the view one got on the High Line. They hoped the thing hadn't cost too much. I said that it had cost a great deal of money, and more was being poured into the project every day. It was the most expensive new park in the City, and our Mayor's pet project. They rolled their eyes the way only visitors can when confronted with the folly of New Yorkers. There's really no call to espouse another reason while old bluestone sidewalks are so much more aesthetically pleasing than concrete sidewalks. We all know it is. But here's one anyway. 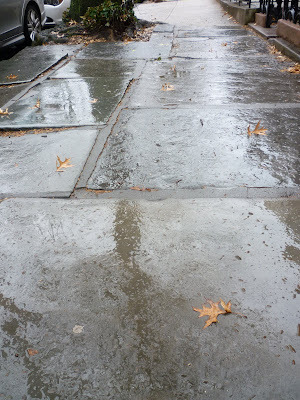 Above, is a stretch of bluestone sidewalk in the rain. Notice how it shimmers, how it reflects the sky and the shapes of the things around it? 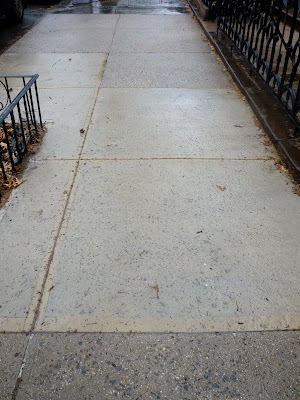 And here is a piece of concrete sidewalk in the rain. Dead, blank, mute. It has no communication with the surrounding block. Just some square slabs. 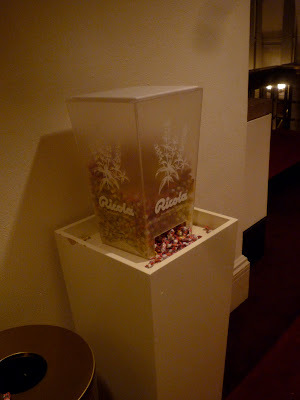 At Carnegie Hall, there's a Ricola dispenser. Just a precautionary measure against the need to cough during that symphony. But I think most patrons were loading up on these things (and they really were) because they taste good, and, well, they're free. 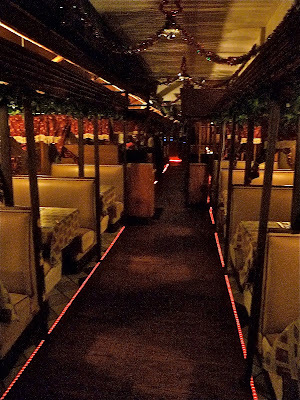 A few weeks back I blogged about the lost Jackson Heights tiki restaurant The Dragon Seed Restaurant, which once sat at the corner of 37th Avenue and 86th Street. It closed in the 1980s, but the legend of the funky place, a fav of Louis Armstrong and sport car enthusiasts everywhere, lived on. 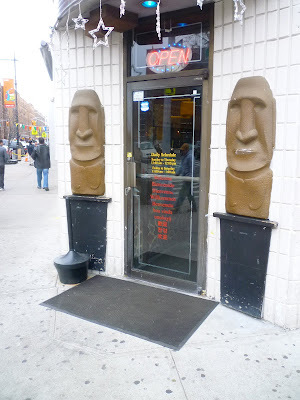 One reader told me that, even though it is now a Colombian joint, two tiki figures still stand on either side of the entrance. This is true. But a couple other readers mentioned that the Dragon See tiki decor remains intact inside! Including an elaborate fountain. I had to go see. And Shazam! It's all true. The Dragon Seed still exists, at least in form! Except you can only eat Columbian food (and fries and fried chicken) there now. No Mai Tais. 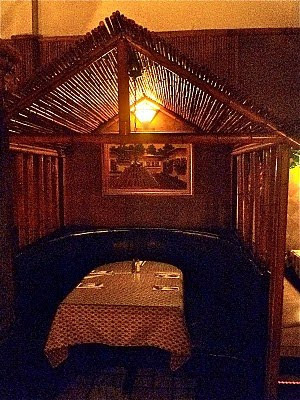 There are more tiki figures inside, and bamboo hut-like booths. The bar is also a vision of tropical escape. And the lighting is very dim. Best of all is the tiered, sculpted fountain which greets you on the right as you come in. It depicts, in great detail, what I take to be a rural Chinese landscape. There are houses, people, a fishing hole, bells, cliffs, trees. I couldn't take it all in in one go. The waitresses are not dressed as tropical maidens. But their costumes are something else, and worth a trip in itself. The owner has them in a sort of South-American version of St. Pauli Girl laced-corsets and extremely short skirts. It's very sexist, quite hilarious and the women don't seem embarrassed at all. I'm sure they get plenty of tips. However you feel about the crazy legal battles that have raged over the past couple years, this is not a happy development. 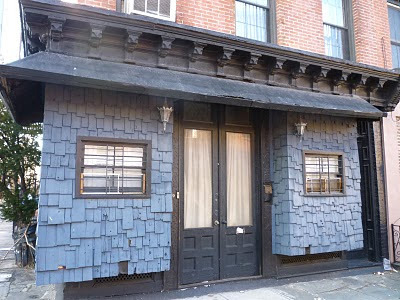 In February, I posted an item about the northwest corner of Degraw and Hoyt Streets in South Brooklyn, wondering aloud what the curious blue-shingled former storefront must have been back in the day. It used to be a grocery called Russo's. Mr. and Mrs. Russo lived in the back. My informant was a former delivery boy from the 1950s. He also said, when he worked there, it didn't have the blue siding, the windows were bigger and cornice was painted red. This news surprised me. Another source told me that that Russo sold the store in 1968 to "Jimmy the Arab," and then bought Pops Pool Hall on Second Place and Court Street. It sounded plausible. And my source seemed certain in his information; I even sent him a picture of the address. So I was satisfied, though I had learned nothing about the equally mysterious empty lot between 395 and 397 Degraw, just behind the corner storefront. Then the other day, I received an e-mail that threw all my previous "findings" out the window. 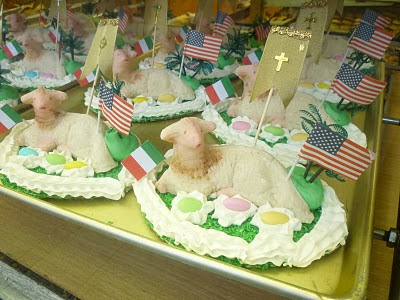 I visit Trieste Restaurant in Jackson Heights; Norah Jones Adds a Skylight; Carroll Gardens Gets a Yarn Shop/Wine Bar; Big Tim Sullivan's Hometown Lives On; Carroll Gardens' Anti-Landmarking "Group" Spews New Lies; Plywood Action Resumes on Court Street; Vespa Properties Thinks It Owns the Sidewalk; Marzipan Lambs Are Back. Lost City Asks "Who Goes to Trieste?" Trieste, on Northern Boulevard in Jackson Heights, may be the most isolated of the restaurants I've profiled for "Who Goes There?" But I urge you to go anyway, and order the gnocchi with veal sauce. You won't be sorry. There are plenty of Italian restaurants in New York that make their focus the cuisine of Northern Italy. But Trieste? Who spotlights the food of that odd, quasi-Austrian seaport on the Slovenia border? As far as I can tell, only the Jackson Heights, Queens, restaurant that's actually calls itself Trieste. It was founded in 1978 by Lorenzo, Romano and Elio Honovic, three brothers from the Istria peninsula. They didn't make it easy for you to enjoy their specialties. The restaurant hides in plain side on an ugly block of noisy, dusty Northern Boulevard, right across from a garish IHOP. To patronize it, you either have to live nearby or have a car. Further masking the considerable attractions of the kitchen are a window-darkening set of heavy vertical venetian blinds—a mind-your-own-business decor gesture typical of old Italian joints. Also typical is the faceless "fine dining" decor found inside. A small sleek bar; ecru walls; simple square tables with white tablecloths; the requisite display of wine bottles. Trieste underwent a renovation six years ago that removed every scrap of character from the room. 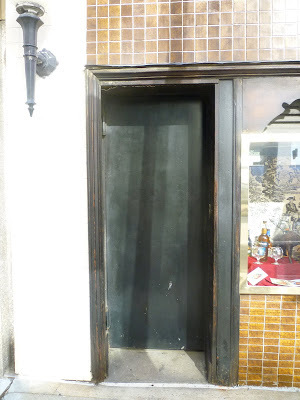 (There used to be a cute little coat room, and the bar was at the back.) The only survivor of that overhaul is a huge, wonderful, old framed photograph of Trieste, circa 1800. Things are kept simple at Trieste. The menu, full of veal and seafood dishes and delicious home-made gnocchi, hasn't changed for 30 years, I'll bet. There are a couple dozen entree choices, and prices are very reasonable. Old, doughy Elio, who is now nearing 70, still works the kitchen. (Romano died of colon cancer recently, so only two brothers remain.) And the courteous, personable Bruno, in black jacket, is almost always your waiter, lunch or dinner. The diners either live in the area or drive in from other parts of Queens. (There is parking in the nearby car wash, but only after 7:30.) They are familiars, and they greet Bruno and Elio warmly. Mainly middle-aged men, who probably got hooked on the food during the Reagan administration, they gather in groups of two and three and enjoy long, leisurely meals, beginning with martinis and vodka rocks (prepared by Bruno, who doubles as bartender) and slowly grazing through the complimentary garlic bread, carrot sticks and cheese. They get to ordering around the 45-minute mark. Things are kept casual. A man or two will eat at the bar, talking to Bruno in Italian. Elio breaks from his hot stove to deal with a troublesome tradesman out front. The two argue outside the front of the restaurant until Elio makes his point. He's old and soft-looking, but I doubt he loses many arguments. The place sometimes feels like a men's club, as one might expect from a restaurant owned and run solely by males. The Honovics' male customers take a long time leaving Trieste. You can't blame them. Once you step outside the threshold, onto the cold, gray Northern Boulevard sidewalk, the world doesn't look nearly so welcoming. And the folks at IHOP don't know how to make your martini the way you like it. 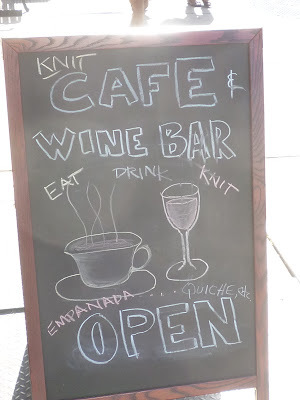 La Casita, the yarn shop that opened three months ago in the Boerum Hill space that once housed bistro Patois, has opened up a wine bar in back! The owner expects to have the wine list ready by the end of the week. Right now, there are just a few selections by the glass, and a few by the bottle. White, red, rose. Even a "house wine." Nice idea. Weird idea. Knitting requires concentration. Won't a glass or two cause the lines to go astray a bit? Some kid's gonna get a pretty funny looking set of booties. 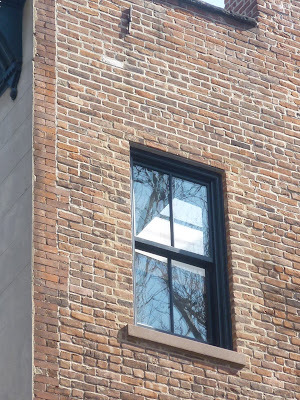 The Landmarks Commission allowed Norah Jones to bust out seven new windows on the side of her newly bought Cobble Hill townhouse—not ten, like she initially wanted. But it looks like she managed to get an eighth new light source in there anyway. 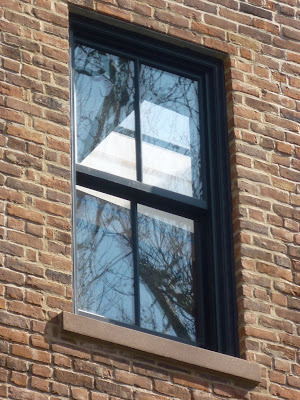 Unless, I'm mistaken, I spy a new skylight through one of the newly installed top-floor windows. Jeez, what's she gonna do up there that she needs so much light? Paint watercolors? 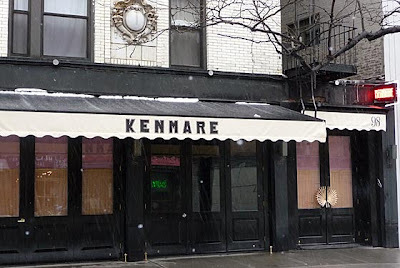 The food blogs are all lately abuzz about Kenmare, the latest project from restaurateur Joey Campanaro. I wonder if Joey realizes what a piece of ignoble, if rather funny, 19th-century political chicanery he is furthering by naming his eatery after Kenmare Street. The Brooklyn dopes who are fighting the long-needed push to enlarge the Carroll Gardens Historic District—which will curb rampant and irresponsible development—have a new lie to peddle. Earlier, this brain trust, which seems to have its headquarters at Sal's Pizzeria on Court Street, argued that landmark protection would hurt home owners where in counted most—in their wallet ('cause that's the only thing that matters in this world, right?). Now, they're whistling a different tune, meant to cynically cater to the preservation crowd. 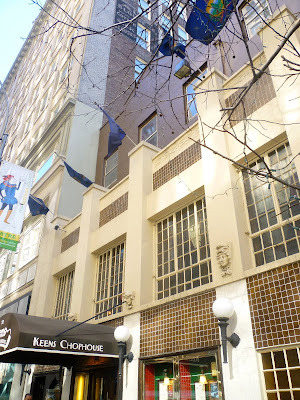 Whenever I pass Keens Steak House, I pause to admire the old building and its many singular details. 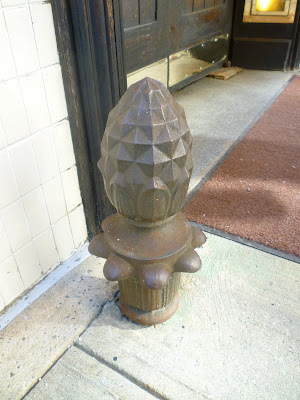 The heavy metal pineapples on either side of the entrance, which once served as, I don't know, maybe boot-scrapers, or door stops. So, the other day, I was admiring the many old bottles in the picture window to the left of the entrance, when I notice an old, inset doorway to the immediate left of the window. It's warped and slanted with time. There is no handle; it is evidently not used anymore. What was it for, I wonder. This is the actual original Ray's, on Sixth Avenue and 11th Street. I think it's the abundance of large windows that really makes this corner storefront. The life inside the the store—pizzas being made behind a checked counter, pizza beaten eaten in a spacious dining area—is clearly visible even from across the block. It adds to the life and vibrancy of the street. And at night, the with light pouring out of the windows, the shop seems to fairly glow and bubble with positive activity. The fine, if simple, signage, handsomely lit from above, as opposed to within, only adds to the address' old-fashioned cheeriness. I don't usually eat at Ray's, but I always smile when I pass by the store. One of the best in the city. Nothing like it. Cuban food. Check out the lantern with the dripping candle. And the spiffy pig in the top hat! I remember that when I was a kid in the 1970s, Brooklyn Union Gas used to put eggs in the windows of its headquarters on Montague Street. Around Easter the eggs would hatch. We would go and watch the eggs develop, and then go and see the chicks. Brooklyn Union Gas is now called something else and later moved, I think to Metrotech. I'm pretty sure they don't do this anymore. 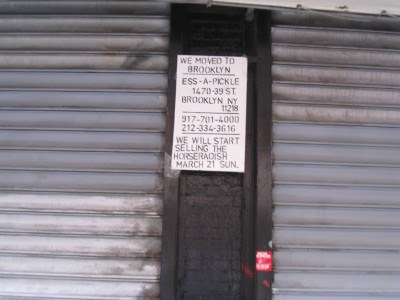 If anyone is wondering why there are so many nostalgic blogs for "the old New York", there used to be a lot of cool things like this, in fact they weren't even considered to be that remarkable, and now, not so many. Way, way, way back in spring 2007, there was a mighty bit of action on the corner of Court and Degraw in Cobble Hill. Construction was underway in the former OTB location with local scuttlebutt being the place would be owned and run by the same guys who own P.J. Hanley's, and ancient tavern just down the road, and South Brooklyn Pizza, not to mention a rockin' apartment in TriBeCa. 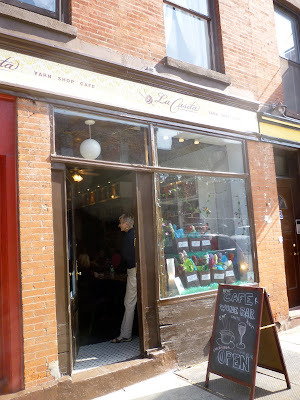 I remember a notice on the plywood saying the coming French bistro was applying for a sidewalk-seating license. Then everything stopped, and the boarded up corner space was silent for months....years. Well, something new is going on. The place has a new set of plywood, and it's all-encompassing. That place is boarded up tighter than a drum. And there's a new set of building certificates outside. So, are the Hanley's dudes still involved? They seem to be expanding a lot lately. 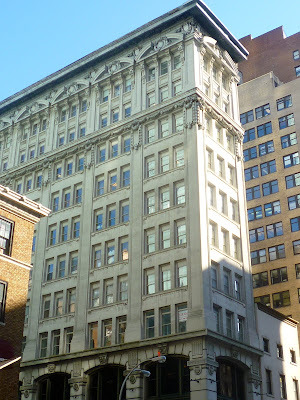 This lovely old building on Fifth Avenue in the 30s, while bright white on the Avenue side, seems to bear a pale green tint on the street side, as if it were made of oxidized metal or a specific type of colored marble. The fancy of a creative architect a century ago? 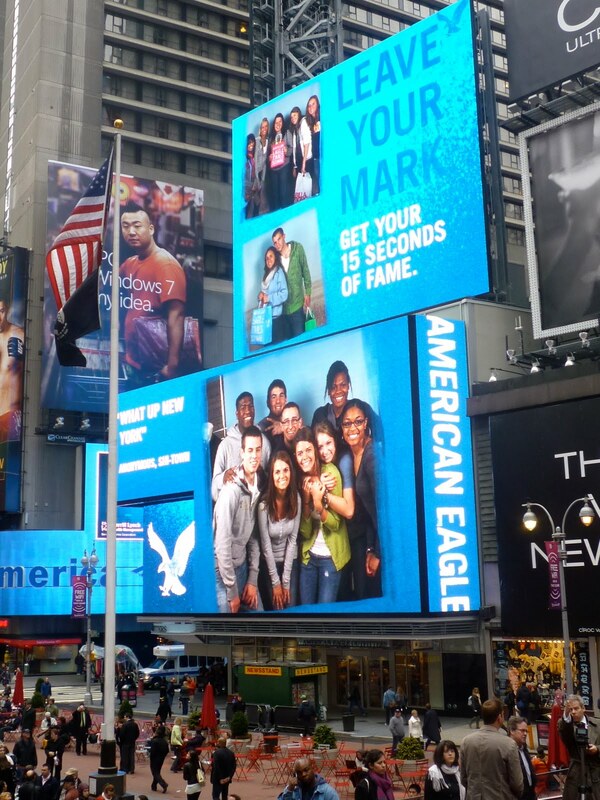 See the old painted, wall ads above. Nice, huh? But nothing special. 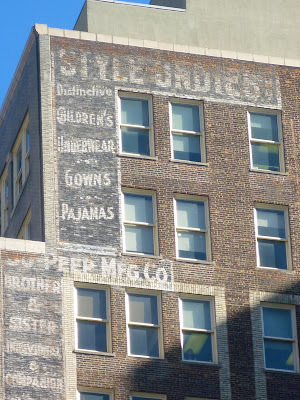 Such faded advertisements can be found all around town. But these ads are on the side of building on W. 36th Street and it's neighbor is—Keens Steakhouse, which has been around since 1885. That means that Keens customers have seen those ads as long as they're been around. When Lillie Langtry ate her mutton chops in the early 20th century, she saw the ad for Style Undies and the Eagle Blouse Company. And the businessman today still sees an ad for Style Undies. Nice continuity. The Most Untouched Block in SoHo? Norah's House of the Seven Windows Complete! The Pink Tea Cup Returns!